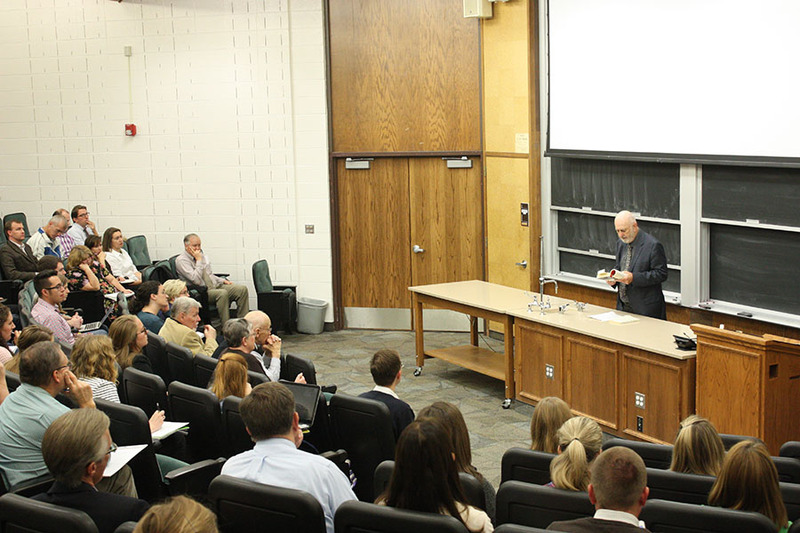 In this year’s Nan Grass lecture, Phillip Lopate encouraged a personalized approach to teaching creative writing. PROVO, Utah (October 22, 2015)—This year’s Nan Grass Lecture speaker, Phillip Lopate from Columbia University, has taught creative writing courses for students all across the educational spectrum, from elementary students to those in graduate programs. Strangely enough, he’s found that regardless of age, all students require the same level of attention. A common method for teaching creative writing is the writing prompt. Teachers present students with a jumping point for an essay, short story or poem, designed to promote a new angle of thinking. Prompts Lopate has used in the past have included writing portraits of family members, eavesdropping on conversations in the hallway, observations of their surroundings and more. But if Lopate has learned one thing, it is that there is no blanket approach to teaching students to write, and searching for the perfect writing assignment is pointless. In Lopate’s experience, it is much more important to get to know students individually and help them to progress in their own directions, with personalized instruction. Reading from his book Being with Children, Lopate shared examples from his own career of teaching children to write poetry. To one student, Lopate presented a poem written in French and asked the boy to write the translation. The boy protested that he didn’t understand French, but Lopate suggested a technique called “mistranslation,” which relies entirely on guesswork and sound association. The student proceeded to mistranslate portions of the poem, then worked to fill in the blanks by making narrative connections. The end product was a new, unique poem written by a student who had once thought he couldn’t write at all. While working with another student, Lopate noticed the boy tended to humanize objects. He suggested the boy dictate his poem, just describing a typical day in his life. Lopate listened, added line breaks and punctuation, but otherwise left the prose untouched, producing a poem that surprised student and teacher alike in its elegance. The experience became an act of self-discovery for the student, who likewise thought he couldn’t write, and whose own mother worried for his mental health. The key in both teaching experiences was finding the writing prompt that best inspired the student in question. Lopate explained that the most important thing in getting students to write is helping them listen to their own minds. He said, “They seem to think that writing is something that happens ‘out there,’ not ‘in here.’” But, he explained, once they learn to write with their own intelligence and in their own voice, that is when real creative writing can begin. Samuel covers events for the English Department in the College of Humanities. He is a junior pursuing a degree in American studies with a minor in editing.